I’ve never quoted an indie rock band before, but I revel in new experiences. “The dance on the cosmos shows. The stitches of space that slowly come and go. As above, so below.” Profound, I’m sure you’ll agree. I thank The Klaxons’ Jamie Reynolds and James Righton for gifting those words to the world…whatever they mean. And I must also acknowledge the role of a Dewsbury graffitist who brought them to my attention. We don’t scrawl poisonous expletives in West Yorkshire; it’s all very high-brow. By ’eck. In the nick of time, that verse’s unlikely setting brings relevance to my ramble. It had been daubed on the copings of Headfield Viaduct which spent its operational days hauling a short connecting line over the flood plain of the River Calder. Dormant for more than 20 years, it is about to find function again, albeit of a less gruelling nature. 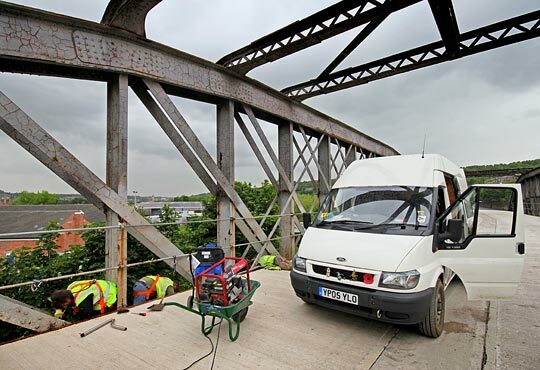 Sustrans' construction team clear out the lower chord of the bowstring truss. It’s quite fitting really - Dewsbury has a history of finding value in the unwanted. When the industrial revolution came, the town was a centre for the shoddy and mungo industries whereby old woollen items were mixed with new wool to make blankets and uniforms. Its many mills have stood idle since the life ebbed from West Yorkshire’s heavy woollen district, but some have been rejuvenated of late as eye-catching apartment blocks. Recycling isn’t new - Dewsbury knitted the T-shirt. The London & North Western first brought a railway there in 1848, driving today’s TransPennine line northwards into Leeds. Next to arrive was the Lancashire & Yorkshire. The Great Northern came from the east in 1874, completing a through route six years later. And last to join the party was the Midland, just after the 20th century turned. There was some uniting of these independent networks in the 1880s when, to avoid the expense of constructing new lines, the Great Northern agreed to build a number of short connections to the L&Y system. One such was the half-mile Headfield branch which opened for goods traffic in October 1887. Climbing a stiff 1:55 gradient towards the town, it was built almost entirely on embankments or bridges, including a bowstring span over the Dewsbury cut of the Calder & Hebble Navigation and a viaduct comprising 14 masonry arches, one span of plate girders and two more formed of bowstrings, the latter pair crossing the river. Let’s just agree it was well engineered. But it was never heavily trafficked, succumbing to economics in May 1933. Although 1965 saw its rebirth as a single track goods route, it was signed out of use once and for all in 1990. 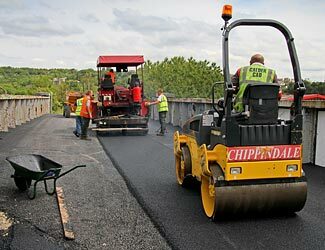 Tarmac is laid on the bridge over Mill Street East. Members of the Sustrans team check out the new ramp down to the canal towpath. As our roads overflow, driving ‘modal shift’ has emerged as a political priority. The past 30 years has brought an awakening to the role redundant trackbeds can play in promoting alternative forms of transport for local journeys, specifically those involving feet and bikes. And their positive social value has been recognised though public capital investment. In 1995, when the track was being lifted from the Headfield branch, sustainable transport charity Sustrans was the beneficiary of a £43.5 million grant from the Millennium Commission to extend its National Cycle Network (NCN). Another £50 million was forthcoming in 2007 to fund the Connect2 scheme, this time from the National Lottery. Over the years, the charity has found challenges with rail operators wanting to share alignments, but the success of the NCN is undeniable and overwhelming - it now extends over 12,600 miles and saw 407 million journeys in 2009. Dewsbury isn’t prosperous anymore. Three districts at its fringe are amongst the 10% most deprived in the UK. Connecting communities - in the widest sense of that term - is one of the things cycle paths are good at. So it’s unsurprising that Kirklees Council last year asked Sustrans to consider the feasibility of creating a network of local paths, bringing some outlying areas ‘closer’ to Dewsbury’s centre. They also wanted to penetrate a physical barrier formed by an escarpment that runs across the east side of the town. Phase 1 involves the creation of a two-legged path - one heading south to Savile Town, linking a riverside lane with the canal towpath by means of the viaduct, and the other reusing a short section of the GN’s former Ossett-Dewsbury line. Whilst a steering group has been established to oversee development of the wider network, these initial routes relied on the planning process to gauge local opinion due to funding deadlines. Perhaps understandably, there will always be those who want the money spent on filling potholes but both the council and Sustrans’ believe that this scheme will help to realise longer-term social benefits. 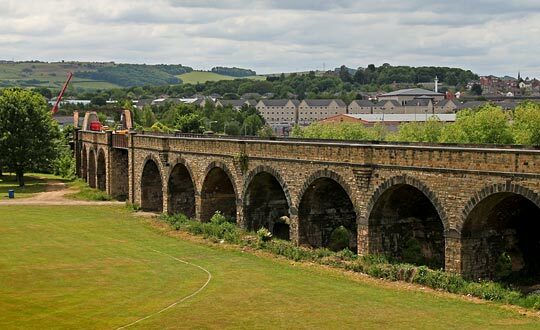 The viaduct's masonry spans, set against the backdrop of Savile Town. Having been transferred from the custodianship of British Railways Board (Residuary) to that of Railway Paths Ltd in April 2001, the structures of the Headfield branch have continued to benefit from annual visual inspections and detailed six-yearly surveys. But the project has brought with it the financial opportunity to extend their life through physical works. The highly skewed bowstring spans over the river - one of 126 feet in length, the other 110 - are the most degraded, certainly in terms of cosmetics. Here a concrete deck has been cast whilst the trusses’ lower chords - which act as a corrosive water trap - have been relieved of their detritus and waterproofed. The masonry structure is in very decent condition and has been tarmacked, with falls to drainage gulleys at several points and a concrete channel inserted along its centreline. The approach is pragmatic and designed to deliver maximum benefit for minimal cost. So no, the girders are not being repainted. Creating access points onto the path has involved the construction of ‘cut and fill’ ramps from ground level, narrowing the top of embankments at either end. Reclaimed sleepers have been deployed to act as a low retaining wall on the slope down to the canal. To achieve a maximum 1:20 gradient, works at the northern end were quite significant, demanding a nine-metre climb up to the former site of Dewsbury South Junction. 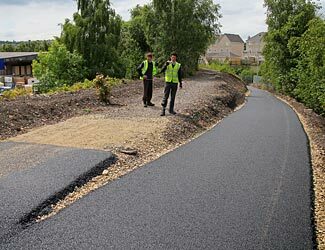 Grafting hard has been Sustrans’ own construction team, employed by Kirklees Council, with Calder CAD acting as sub-contractor for the tarmacking, laying a 2.5-metre wide path on a 3m sub-base between the various structures. The official ribbon cutting is due later this month. Waterproofing is lavished on one of the bowstrings' lower chords. Beyond this initial phase, it is hoped that more former trackbed will be brought back into public use, and perhaps a short operational section too. 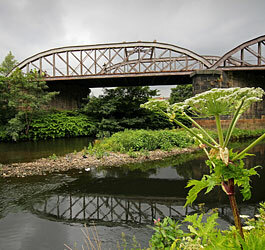 Negotiations are ongoing to extend the path over the canal bridge and onto the streets of Savile Town, squeezing it alongside D B Schenker’s siding from Dewsbury East Junction. I’m getting carried away now, aren’t I?